The "about us" area will be the opportunity for store owners to tell anything unique about the store that would give consumers insight to the history or culture of the store. Note that your store logo or photo of your store will be available to be published. 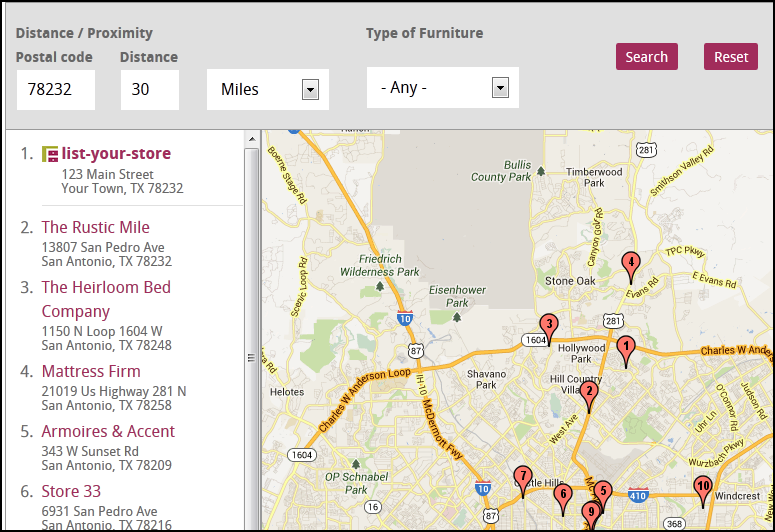 Preferred Retailer status will allow your store to show up first in search results based upon zip code. Preferred Retailer status will require an interview with Furniche.com for validation. Upon listing, your store will be allowed to define the following product categories being offered in store. This function also allows visitors to search by category offered by store. Have something unique? Categories may be added. Bold and Italics available as well as underlining color highlights and links to email and websites plus other formatting options. Track visitors to your store by inserting online coupons or discount trackng codes. Click Here to view a sample coupon. Get Listed Now. Click here to start! Tell shoppers how long you have been in business. This supports your credibility with customer service and demonstrates longetivity in your market area. Many furniture stores and companies particpate in local events and charitable organizations. There is the ability to link to your local event or charity organization in this area. Email links are also available here. Explain delivery and pick up options here. This area has full linking capability to websites or email addresses. Financing options are important to furniture shoppers. Use this area to explain standard financing options including lease to own. This area has full linking capability to web sites or email addresses. If Design Services are available please note them in this area. Full website and email linking available in this area. Custom orders and policys often require explanation. This area would be used to define your custom order capability. Full linking to websites and email addresses available in this area. If your store offers lay-a-way then it may be explained and defined here. Any Price Guarantee that may exist in your store may be explained in this area. General warranty information or opportunities to purchase extended, fabric or leather warranties. Store warranty or policy information may be listed here. This will be a place to speak into your inventory on hand. Perhaps you have plenty of mattresses in stock for immediate delivery. If you are store that sells directly from the floor this would be the area to define that aspect. If needed there is capability to link to a suppliers inventory or an email link for any questions. Take credit for any brand names carried in the store. This area has full linking and email capability in the event a link to a manufacturer site is desireable.